“It seems like a flying cow shat on my head,” a client wrote when he got some unexpected news. (I dashed him a quick reply encouraging another interpretation with maybe way less-evocative imagery!) Another sent me an SOS, “I actually feel like I'm falling apart at the seams.” I wrote back calling attention to her metaphor by looking at it literally: “You're absolutely not falling apart at the seams. You have no seams. You can look right now and notice that you're intact. Your body is intact. Your hair is intact. Your face is intact. Your history is intact. Your personality type is intact. Your coaching process is intact. Your soul is intact. Your home is intact.” She found such solace in this recasting that she reviewed it enough times to be able to quote it. (I learned this when she thanked me for my words next time we met and I looked at her blankly). As you move through hard times, harsh circumstances, or tricky situations, it helps to be very clear about what is and isn't actually happening. How you speak (think, write) about it matters. I often point out people's metaphors, which may seem harmless and even fun—who doesn't love colorful speech? Sometimes people feel like it's okay to talk about harsh things going on for them if they put some interesting linguistic spin on it: somehow they sound less like complainers; or they can at least provide a bit of entertainment for the poor souls listening to their travails. Once I've made clients aware of their language, they sometimes get self-conscious and start sentences with disclaimers—“I know I should never talk like this but ...” Actually, you should talk however you talk. Speak your uncensored mind, and it will serve you well if you also hear yourself and catch the distorted, overblown words you speak. Do they exaggerate your difficulties? Declare that what you want is impossible or that there's something wrong with you? Posit you as the victim of anyone or anything? Question the thoughts revealed by your speech. Consider whether you actually believe what you're saying. In fact, in the above example, I wasn't all alone by a long shot; in that very moment, I had my friend's rapt and entirely compassionate attention. What was truer was that I felt temporarily disconnected from source and guidance and needed to spend some time reconnecting, then questioning my thoughts. I proceeded to do just that. Someone told me of a song and dance she had to do for someone. Nope. No song, no dance, and no have to. I especially love to point out victim speech (it's so disempowering! ), and you're a victim if you have to do something for someone else—even more so if this thing involves contortions and manipulations. You can't be a victim when you're in choice. So if you choose to sing and dance, by all means, do just that, and do it with gusto or grace or whatever pleases you. You could also choose to stand firm and speak clearly and simply say whatever you need to say to someone with no embellishments thrown in to make them feel okay about you or what you're saying. Don't wanna be a victim? Let me repeat myself: you can't be a victim when you're in choice. Cultivate a consciousness of choice. Your language can support you in that effort. While looking at the possibility of working on a project with someone reputed to be difficult, a client metaphorically used the words “I may not want to get in bed with him.” I told her that I personally would be very quick to drop that particular turn of phrase. Maybe it's just me, but don't you think it feels very different to get in bed with someone than to collaborate with them professionally and creatively? Using that language, I can't imagine being on my surest footing as an equal with someone who's a challenging match in a professional situation. Notice that you can actually make yourself smaller and weaker or somehow put yourself at a disadvantage by the way you describe your position in a game. Or you can do just the opposite with different language. Again, don't try to control your language. Eavesdrop on yourself to let your word choices show you more about your perceptions. If what you hear sounds sketchy to you, make like a smart phone and auto-correct. Yet another client told me recently that she felt the world was passing her by. As soon as that came out of her mouth, she beat me to saying, “That sounds like victim language.” I encourage gentleness with this awareness. It's not about catching yourself being wrong. It's about witnessing what doesn't serve you and course-correcting toward what does and what better matches the intentions you hold. This particular client has been engaged in some bold explorations to rethink her career path, and the world can only be passing her by if she interprets her colleagues' promotions and new jobs as meaning they're achieving what she can't get to. Actually, she doesn't even want the kind of changes they're making, as they're moving around within a system that she's seeking to exit altogether. If she interprets their gains as a sign that success is very close by—it's all around her!—and also honors all that she's been up to lately that's very likely to land her somewhere else in due time (or divine right time, if you will), then the world is her oyster, containing and supporting her, with some beautiful new pearl in progress. I often point my clients toward harnessing their power of interpretation. The man with the metaphorical flying cow saw with little prodding (he's quick) how his words to me showed that he felt—well, shat upon. He considered that he might interpret everything happening as guidance and direction in certain realms where he was actively seeking to make changes. How could this not be good? He recast what looked like bad news initially as a sign that life was supporting him to make some crucial shifts. He also looked for and found the safety nets actively built into a situation that challenged his sense of security. Life is full of safety nets, we decided together, and actually pretty short on flying shitting cows. Your choice: "The world is passing me by" or "The world is my oyster." Sign up for (pretty much) monthly mailings. They come just once a month, or not quite. There's a one-click unsubscribe option. Your contact info is never shared. 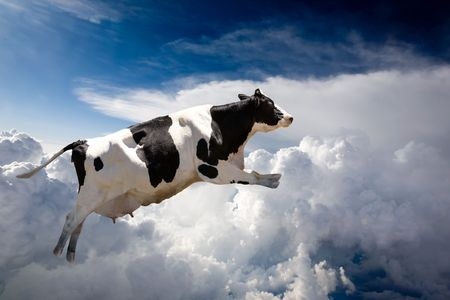 Do you shield your head from the danger of flying cows? Heal from the Ground Up! Michael Hsu, a coach and huge heart working out of California, had the vision to create an online radio show featuring coaches in action with clients (no scripting or practicing beforehand!). Thanks to the magic of Google and my focus on trust, he found me and included me in his lineup. The shows air weekly and collect archivally on his website. Michael is all about healing. He urges listeners to connect to the fears and desires of the client and imagine the coach is talking to them. His intent is for people to have a true healing experience in the listening as opposed to a passive eavesdropping. My first podcast, They Should Believe as I Believe, goes live on Friday, August 1. This coaching session explores the difficulty of navigating the tricky discord with loved ones when their belief systems don't match ours. We often get reactive and end up feeling as infuriated with ourselves as we are with them. Here, we look at welcoming ourselves to the human race: who hasn’t felt the friction of conflicting belief systems? When we begin with being gentle with ourselves in our reactiveness, we can then gently dismantle the reactions. You can be the client in a future podcast of mine. To qualify, you simply need to be someone I've never worked with before. Write me at jaya@jayathetrustcoach.com to inquire. So why am I still in Ithaca? Well, I seem to be holding down the home front. In honor of the teaching and rejuvenating I would have been doing there, I'm carving out 5 no-client days to write write write at the beginning of August. This feels great. The book I'm working on now has real sections and chapters and content. Kind of amazing to watch it come into being. Check out some of my writings on living with clarity and intention in a kind process of personal/spiritual growth: "inspired words" page on my website. Just ask. Ask for help. Ask for support. Ask for favors. Ask what you can to to be of help or support. Ask for a miracle. Ask for a do-over. Ask for silence. Ask what else is possible. Ask what the other person's experience is. Ask to be listened to. And then ... trust that you're okay, completely okay, and whatever you get is enough, and what you don't get is only withheld right now and only because there's something else for you to get in its absence. Keep asking for miracles. I've found they abound.